Early July turned out to be something of a Mike Curry benefit. With Anisia Shami, he won the Auckland Club’s Thursday Bruce McLaren Swiss Pairs, and matched that on the following Saturday by winning Mt Albert’s 3A with Neil Stuckey; at the latter, the Intermediate event went to Jacinda Manconi and John Craig. 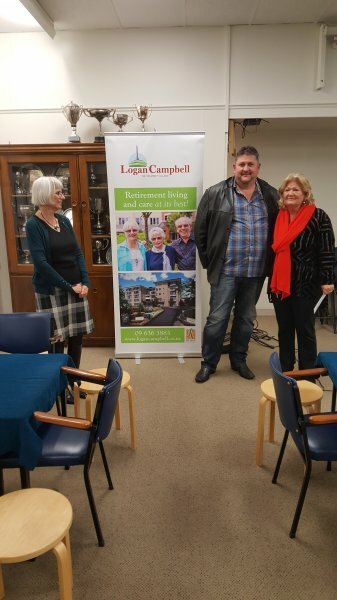 Mike’s Auckland achievements were sandwiched between a win in Te Aroha’s Spa Town Teams and a 4th place in the Hamilton Open Teams (both in our neighbouring Waikato/Bays patch). Clearly running hot ..... The Howick Open was an inaugural success for new partnership Nong Li and John Wang, while the Intermediate saw Judy Canton and Rosemary Jackson walk away with the winners’ envelopes. The North Island Pairs was held at the Auckland Bridge Club in early August and saw a great come-back from out-of-towners, Blair Fisher and George Masters who showed that you can recover from really bad starts to win such 5 session events. The unlucky pair just pipped at the post were Jeter Liu and George Sun. While the above tournament was taking place, William Wang and Xiao Liu were enjoying themselves at the Howick 8B coming home first. Coming just behind them are another MacLeans College pair who are starting to do well in tournaments, Tony Ren and Kevin Hu. Their schoolmates, Vincent He and Zachary Yan, have just had a fantastic learning experience being half of the New Zealand Youth Team at the World Youth Championships in China. Another pair to have a great day were Joey Chang and Brian Craig who averaged 62.66% to win the Royle Epsom Open Pairs, held to replace the cancelled Papatoetoe event scheduled for that day. The North Shore Club is noted for its generous prize money from the equally generous sponsorship it receives from local businesses, and this year’s Restricted Tournament was no exception; as per the Dodo from Alice in Wonderland, “Everybody has won and all must have prizes”. The event proved to be an outstanding result for tournament debutante Jenny Hemmings. Jenny went through the club’s Beginners’ lessons in 2017 and Improvers’ in 2018, and prior to the tournament had amassed the grand total of 38 C points from the four club sessions in which that she had played. To win the event with a score of over 60% from a good field featuring many strong Open/Intermediate combinations therefore represents an astonishing achievement. And Jenny’s partner? All he had to do was simply follow suit and look on in admiration. Here is Jenny in action finding a sacrifice that eluded almost all other pairs. Bold bidding indeed for a novice player! Jenny sat West, initiating a 6 level sacrifice over a cold 5 contract for the opposition. 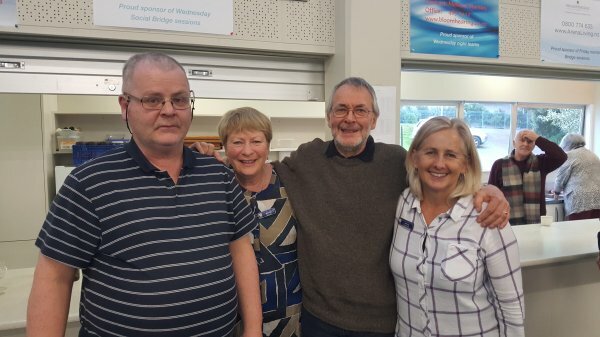 Wayne Benefield, North Shore Secretary, Mandy McLean, Douglas Russell and Jenny Hemmings. This year, the North Shore Club also hosted the annual North Auckland Challenge. This event runs along the lines of a number of club challenge competitions, with each of the five clubs fielding an Open, Intermediate and Junior team. This year, the host club repeated its overall victory of 2017, placing third in the Junior category, second in the Open, and winning the Intermediate by a huge margin. 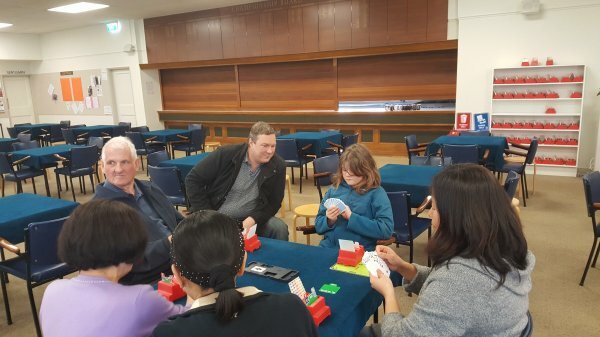 The Auckland Club has started a series of daytime Beginners’ classes delivered by Julie Atkinson. This clearly fills a gap left by the evening classes, with between 20 and 25 attending each week. Perhaps the most encouraging sign was to see 10-year old Emma, daughter of Hamish Brown and Joanna Perfect, at the class, clearly determined to match the achievements of her parents. Equally encouraging was the willingness of Emma’s school, Peninsula Primary, to allow her to participate on the grounds of the lessons’ educational value. Other schools please take note! Finally, some 40 students from four schools took part in a Schools Pairs competition on a Sunday morning in late July at the Howick Bridge Club. There seemed to be an excellent atmosphere and all enjoyed the bridge and the pizzas and chips which followed it! Another such event is scheduled for late October at the Auckland Bridge Club.